Chilli Pickle is a great way to spice up your meal. 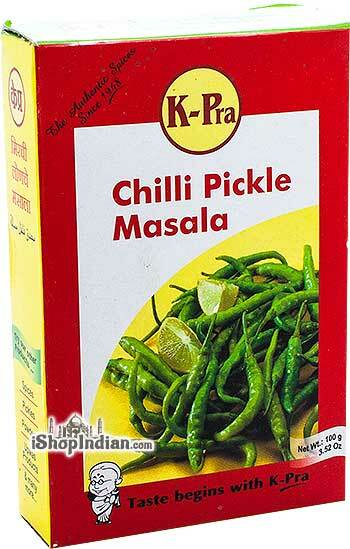 K-pra's Chilli Pickle Masala will help you make absolutely delicious, hot and spicy chilli pickle, Kadhi pakodi, and curd rice. 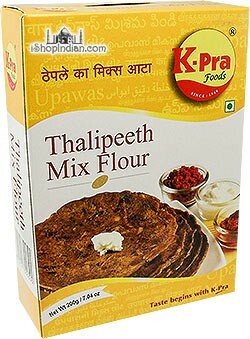 Ingredients: mustard, edible oil, turmeric, fenugreek & compounded asafoetida. 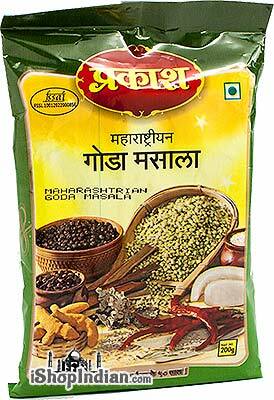 Extensively used in Maharashtra and neighboring states, Goda Masala is a spice blend with a distinct aroma. 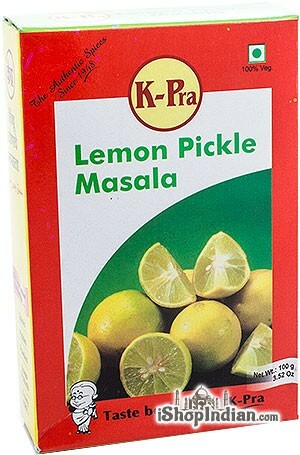 It blends very well in dry bhaaji, gravies, rassas, dal etc. 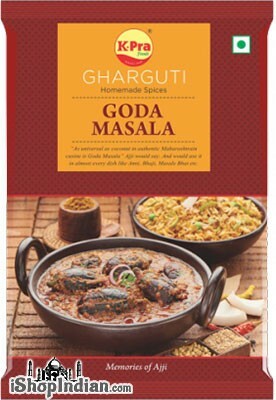 K-Pra brings you the core of Maharashtrian cooking – Goda Masala! 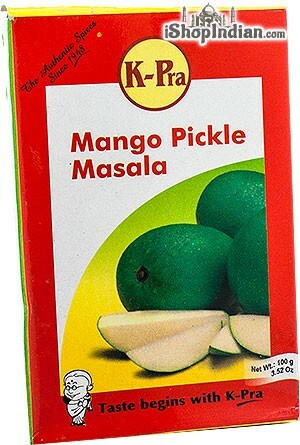 This wonderful aromatic Kpra spice can be used in preparing recipes of a mild nature vegetarian food, masale bhat, bharle wange, and all types of daily dry & gravy vegetables. It can also be used to add flavour in other eatables. Ingredients: coriander, white sesame seeds, dry coconut, edible oil, salt, clove, compounded asafoetida, bay leaves, red chilli, turmeric, cumin seeds, cinnamon, caraway, ananas flower, szechuan pepper. 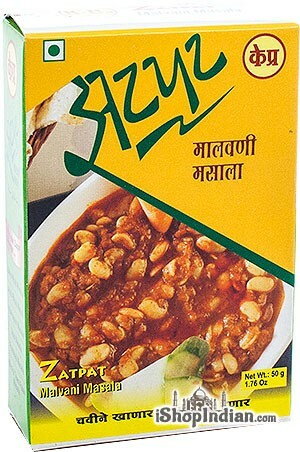 'Bhajani' is a term for a flour made of mixed lentils and grains and some spices, and is typically used to make 'Thalipeeths', a famous snack item from Maharashtra, India. This delicious flavored flatbread is traditionally served with homemade butter and an accompaniment of either chutney, raita, pickle or any other relish. 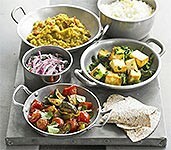 The resulting flatbread is most similar to a Gujarati style Thepla or a thick dosa. 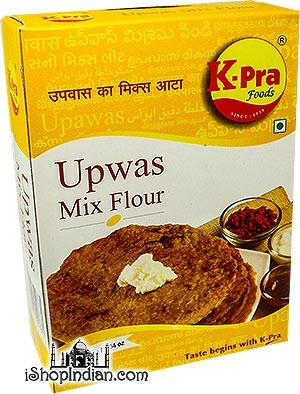 Ingredients: juwar (sorghum), bajra (millet), bengal gram, wheat, rice, black gram, coriander, red chilli powder, salt and turmeric. Straight from the coast of Maharashtra, K-Pra's Zatpat Malvani Masala helps you lend your food a spicy and tangy taste that is as authentic as it is tasty! Ingredients: chilli, coriander seeds, cassia, black pepper, cloves, cinnamon, turmeric, black cardamom, stone-flower, mace, nagkeshar, triphala, star anise, aniseeds, mustard seeds, fenugreek seeds, oil, salt. 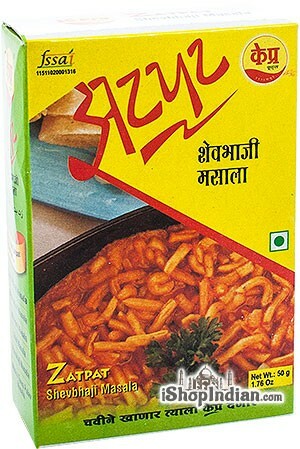 With Zatpat Shevbhaji Masala, you can bring out all the authentic flavours of Maharashtrian cooking. Prepare one of India’s favourite fast foods, that is served in almost lane every in Mumbai, Pune, Kolhapur and other parts of Maharashtra. 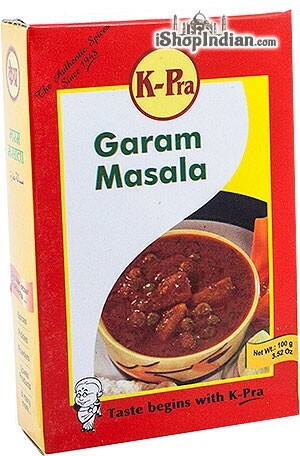 This Masala can help you to cook that mouth watering Shevbhaji. Ingredients: coriander seeds, chilli, cumin seeds, wheat, mustard seeds, chana dal, black pepper, cinnamon, black cardamom, cloves, asafoetida, turmeric, aniseeds, dry coconut, oil, salt. 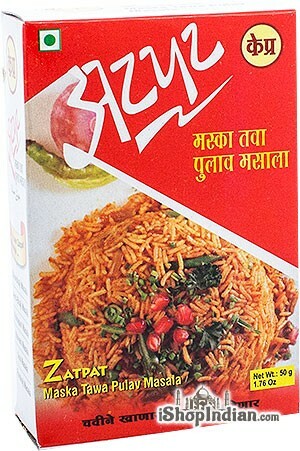 A popular multipurpose seasoning from Maharashtra, India. A strong and flavorful seasoning for soups and curries. 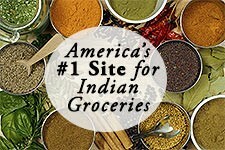 Ingredients: coriander, chili, coconut, salt, sesame, bay leaf, black pepper, cumin, turmeric, taj, clove, cottonseed oil, lichen.